Day and night, the neighbourhood vibrates with energy and excitement. Whether you prefer casual, romantic or exotic dining, Bloor-Yorkville is home to some of the city’s finest culinary artists. Whatever your taste, you are sure to find something that pleases your palate! While Bloor-Yorkville is a wonderful place for strolling, shopping, dining and nightlife, it is also home to incredible cultural destinations, such as the world renowned Royal Ontario Museum (ROM), The Royal Conservatory and the Gardiner Museum, which is the only ceramic museum of its kind. The ROM is one of Canada’s largest museums of world cultures and natural history, while Gardiner Museum houses an unsurpassed ceramic collection of more than 3,000 pieces, to include ancient American vessels, fine porcelains of Asia and Europe, and dynamic contemporary pieces. For lovers of music, some local restaurants will feature smaller live music performances, and on a larger scale, The Royal Conservatory offers a wealth of musical performances including classical, jazz, pop, opera, and world music in 3 state of the art performance halls. The Bloor-Yorkville area has long been known as the premier destination in Canada for purveyors of fine art and antiques. Having nearly 40 art dealers and galleries located in the neighbourhood, with everything from renaissance works to modern sculptures, and everything in between, one will surely discover many awe-inspiring pieces. Not to mention all the great works on display by the many Canadian artists of the past and present. Below is a listing of Bloor-Yorkville’s galleries and museums, many of which regularly host art shows and special exhibits. Click on a business listing to go directly into their sites. Some galleries even offer guided tours. Look good and feel great! Bloor-Yorkville has plenty of professional health and wellness service providers, who will offer you the best advice and service in fitness, diet, nutrition, chiropractic, dental and healthcare. Boasting some of the city’s most luxurious guest rooms and spectacular panoramic views, our hotels ensure a comfortable, elegant and memorable stay. For business or pleasure, you can stay where visiting celebrities reside and rest in style. Our world-class hotels are located in Toronto’s premier shopping, dining and entertainment quarter, and are just minutes from the business district. Beyond shopping and entertainment, Bloor-Yorkville offers a variety of professional service options from accountants and optometrists to real estate brokers and lawyers. The neighbourhood is home to many lead advertising firms, as well as numerous consulate offices. For all your pampering needs, Bloor-Yorkville is the health and beauty capital of Toronto, offering a huge array of services from over 125 salons and spas. Whether you are looking for a cut & style, a basic blow dry, a mani/pedi or your lashes and brows need a bit of special attention, our salons and spas will be sure to take care of your needs. treatments to make you feel rejuvenated. Our luxurious spas are here to meet and surpass your highest expectations. Whether shopping for the hottest trends, stylish classics, or designer fashions, Bloor-Yorkville is a shopper’s paradise! Recognized internationally as one of the top ten shopping destinations, Bloor-Yorkville is often compared to other acclaimed areas such as Fifth Avenue in New York, Rodeo Drive in Los Angeles, and Chicago’s Magnificent Mile. Lined with international labels such as Prada, Hermes, Louis Vuitton and Gucci, as well as Canadian retail icons Harry Rosen, Holt Renfrew, and William Ashley China, Bloor Street is Canada’s fashion mecca. Our five shopping centres — Holt Renfrew Centre, Manulife Centre, Hudson’s Bay Centre, Cumberland Terrace and Yorkville Village offer an array of shopping experiences and services, from cappuccinos to personal shoppers. In between shopping, let our salons and spas pamper you with a relaxing treat! With over 125 hair salons, spas, and estheticians, you can indulge in never ending soothing treatments. Bloor-Yorkville is proud to return as the official Community Sponsor for the 25th season of Hot Docs. This is North America's largest documentary festival, offering an incredible selection of over 200 films from Canada and around the world to Toronto Audiences. Screenings will be held at theatres including Hot Docs Ted Rogers Cinema, Innis Town Hall, Isabel Bader Theatre, and Hart House Theatre. Hot Docs 2019 passes and packages are now on sale with individual tickets available as of March 26th. Free admission. Extended hours. Bring family and friends to the ROM on the 3rd Monday Night of each month and enjoy free admission from 5:30 pm to 8:30 pm. With complimentary access and extended hours, visitors are invited to explore art, culture, and nature in the Museum’s 40 permanent galleries. * Plan your visit: April 15, 2019 May 20, 2019 June 17, 2019 July 15, 2019 August 19, 2019 September 16, 2019 October 21, 2019 November 18, 2019 December 16, 2019 January 20, 2020 February 17, 2020 March 16, 2020 *Please note that feature exhibitions are specially ticketed and not included with free admission. Feature exhibition tickets can only be purchased onsite during 3rd Monday Nights Free. Ai Weiwei at the Gardiner Museum The exhibition Ai Weiwei: Unbroken is now open! This must-see exhibition marks the debut of a new large-scale LEGO zodiac, and features some of Ai’s most renowned works, including Sunflower Seeds and Dropping a Han Dynasty Urn, on display in Canada for the first time. Dive deeper into the exhibition’s themes with the AWW Free School, a series of interdisciplinary workshops presented in partnership with Ryerson University. The first session takes place on March 5th and features an in-gallery spoken word exercise followed by a contemplative clay session. Being Japanese Canadian – reflections on a broken world takes place at the Royal Ontario Museum Feb. 2 to Aug. 5th 2019. The Exhibition: Explore a series of artworks interspersed throughout the Sigmund Samuel Gallery of Canada, and encounter personal perspectives on the exile, dispossession, and internment of Japanese Canadians during the 1940s. This installation features contemporary artists who experienced this history first hand, and those who grapple with their parents and grandparents’ experiences. Being Japanese Canadian prompts us to reflect on the long-lasting ramifications of this historical Canadian injustice, and what it means to be Canadian today. The 2019 Hot Docs Festival will run April 25 to May 5, 2019. Hot Docs is North America’s largest documentary festival, offers an outstanding selection of over 200 films from Canada and around the world to Toronto audiences of more than 200,000. Festival packages and passes for the 2019 Festival are on sale. Full schedule announced March 19. Single tickets on sale March 26. Hot Docs Ted Rogers Cinema (506 Bloor St. W.) Email: boxoffice@hotdocs.ca Phone: 416.637.3123 Please visit Hot Docs for more information. Cross over into the world of Bloor-Yorkville – the ultimate fusion of historic charm and modern seduction. We are Toronto’s most celebrated neighbourhood of style and culture offering a unique blend of designer boutiques , fashionable restaurants, plush hotels and world class galleries…700 in all! The Bloor-Yorkville BIA was founded on July 22, 1985 in response to the tremendous commercial, retail, residential and tourist growth that began in Toronto, at that time. 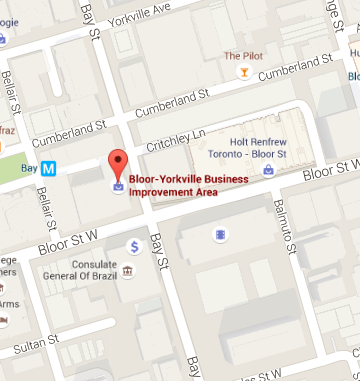 The Bloor-Yorkville Business Improvement Area has a membership of nearly 1600 business. Any business to include property owners/managers, located within commercial assessed buildings, within the tax base. The basic BIA boundaries and pays business taxes, is automatically a BIA member, as a special levy is applied to the tax base. The basic BIA boundaries are St. Paul’s Square to the west side of Avenue Road and Scollard street to Charles Street. You can confirm with our office, if you are located within the boundaries or not. To improve, beautify and maintain municipally owned lands, buildings and structures in the area beyond such improvement and maintenance as is provided at the expense of the Corporation of the City of Toronto at large; and to promote the Bloor-Yorkville Business Improvement Area as a business and shopping area.